After battling it out with one of Europe's best sides in the form of Napoli, Arsenal are set to take on an in-form Watford side at Vicarage Road as they aim to return to the top four places. Although they managed a comfortable 2-0 home victory against the Serie A giants on Thursday, their terrible away form continues to haunt them and should they fail to take all three points, it's unlikely they'll manage to qualify for the Champions League via the league route. In contrast, Watford come into this fixture after beating Wolves in last weekend's FA Cup semi-finals. 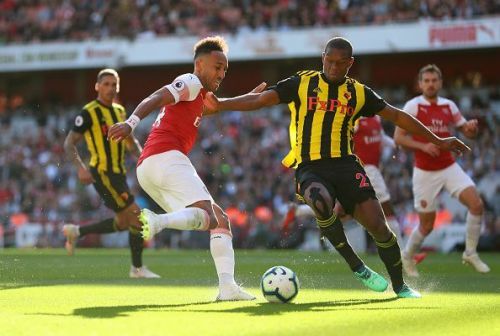 2-0 down in the first-half, they sparked a remarkable late comeback to win 3-2 after extra time, with captain Troy Deeney and Gerard Deulofeu playing significant roles. With significant rest on their side since that morale-boosting victory at Wembley too, Javi Gracia's men will be quietly confident of their chances to upset their London rivals at home under the lights on Monday Night Football. It's an open secret that the Gunners are the only team not to keep an away clean sheet in England's top-flight this season. The fact they have the league's best home record, only behind defending champions Manchester City, speaks volumes about their ability, character and will to win in north London. The 1-0 defeat by Everton last time out saw Unai Emery's side drop three points behind local rivals Tottenham after their 2-0 win over Crystal Palace. Chelsea's defeat away at Liverpool, coupled with United's fortuitous win against West Ham this past weekend will give Arsenal renewed belief that a top-four place is still in their reach - though it's in their hands. What makes them a tougher side to face is the returning Lucas Torreira. They have missed the Uruguayan's influence in midfield often during disappointing away performances and his return is a major boost all-round, not to mention with Granit Xhaka reportedly returning to fitness too. Sokratis starts his two-match suspension after accumulating 10 yellow cards this season, meaning the inconsistent Shkodran Mustafi is expected to start. The game is scheduled for a 12:30 (IST) start and is potentially the Gunners' season-defining league fixture, so certainly one to watch. Predicted Arsenal XI (4-3-3): Leno; Monreal, Kolasinac, Mustafi, Koscielny; Torreira, Ramsey; Maitland-Niles, Mkhitaryan, Iwobi; Aubameyang. Predicted Watford XI (4-2-2-2): Foster; Femenia, Mariappa, Cathcart, Holebas; Doucoure, Capoue; Hughes, Pereyra; Deeney and Deulofeu.